Maruti Suzuki‘s premium cross-over S-Cross was launched in India in the month of August this year. Although S-Cross made some noise it didn’t get as much as attention which the cars like Hyundai Creta got. 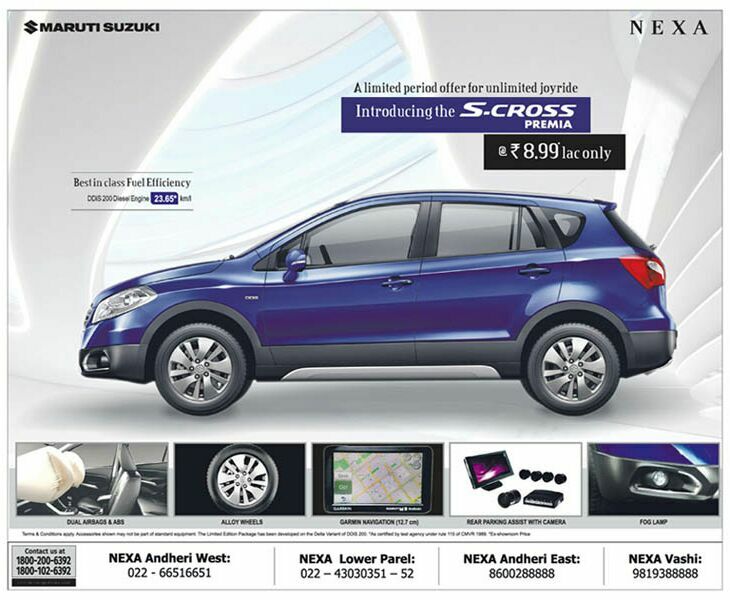 Now, Maruti has announced a special edition of S-Cross calling it as “Premia“. The S-Cross Premia special edition is launched in select cities of India. The S-Cross special edition crossover provides some attractive goodies. Interestingly the S-Cross Premia has been priced very aggressively at INR 8.99 lakh rupees (ex-showroom). The S-Cross Premia is based on 2nd entry level variant Delta DDiS200. The special edition of the car is equipped with alloy wheel and industry-standard features like dual-airbags and ABS (Anti-lock braking System), Garmin Navigation system is going to offer color display, rear parking assist with camera and fog lamps. Essentially, the S-Cross new edition (Premia) bridges the gap between the Delta and its immediate higher variant – and at a very attractive price well. The price of regular Maruti S-Cross Delta DDiS200 retails is INR 9.15 lakhs (ex-showroom, Delhi). This particular limited period offer is available only in limited cities. The company has not officially revealed the duration and locations of Maruti S-Cross Premia’s sales. The launch of the special edition is a clear indication that Maruti Suzuki is looking to clear all its inventory. Under the hood, the Maruti S-Cross DDiS 200 is powered by the 1.3-litre Fiat-sourced diesel engine which can produce a power of 90 PS and 200 Nm of torque. The car’s engine is paired with a five speed manual transmission that drives the front wheels. The S-Cross can also be had with a range-topping 1.6-litre DDiS320 diesel engine, also a Fiat creation, which pumps out 120 PS and 320 Nm of torque when mated to a 6-speed manual gearbox.